All transactions are safe and secure with a reliable history in online purchasing behind each of our associates. 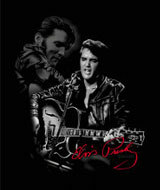 Buy the Guitar Playing Elvis t-shirt to own Elvis clothing and merchandise. The King wasn't just a singer and a dancer; he was also a musician. This Elvis tee features just him and his guitar making fans' hearts melt. During sets like these he worked up an appetite and often went out for a hot peanut butter, banana and bacon sandwich after the show. Satisfy your appetite for Elvis Presley shirts and costumes right now. Since you are bound to get compliments on your Elvis clothing, just smile and simply say, "Thank you. Thank you very much." In addition to the Guitar Playing Elvis tee above, browse the Elvis Clothing Gallery for more apparel like men's and women's clothes, kids shirts or hoodies.